Description: This is a 6-piece Adventure Series white water racing set. FPT1349 - Orange top/yellow bottom one-seat kayak. 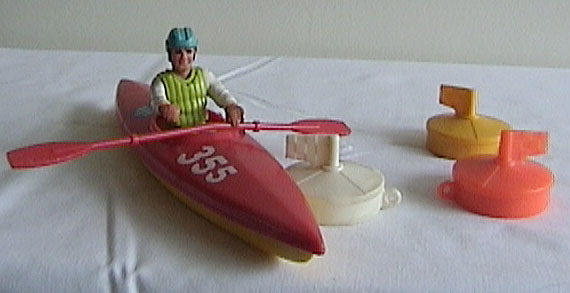 The top of the kayak is marked "355". The side of the kayak has a nook that holds a kayak paddle. 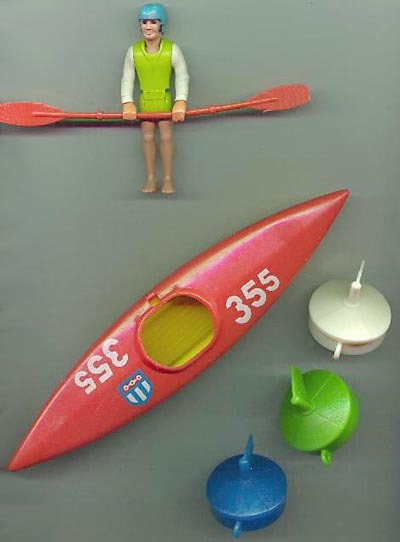 FPT1350 - Orange plastic paddle (double-oar kayak-style paddle). FPT1441 - Adventure Series figure with has a movable head, arms, and legs. Chet - Wears a green ribbed life vest with white long sleeves, a blue helment and shoes, and white pants. *See Variations. FPT3652 - The figure Chet could also have bare legs and no shoes. This set was sold on a 6-7/8" x 11" display card. From 1978 to 1979 this set was also sold in #391 Adventure People Action Play Set Assortment. 1980 - This set was also sold in #393 Adventure People Action Pack Assortment.